18 Year Old Livingston Woman Charged With Robbery, LIVINGSTON, August 7, 2014 - On August 4, 2014 the Livingston Police Department was dispatched to Vanity Fair located at 440 US Hwy 59 Loop South in reference to a robbery that had just occurred. Officers arrived on the scene and determined that the suspect had left the area. Officers received information and were able to develop a suspect identified as Samantha Jo Cervantes, 18, of Livingston. As the investigation continued at Vanity Fair, officers received statements from a witness who observed Cervantes committing theft inside the store. When Cervantes was confronted she attempted to flee the scene. An employee grabbed Cervantes by her purse in an attempt to detain her until police arrived. Cervantes then turned on the employee striking him several times knocking him to the ground. Samantha Jo Cervantes was later located at her residence where she was arrested and transported to the Livingston Police Department. 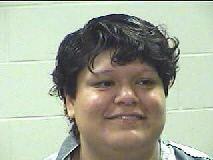 Samantha Jo Cervantes was charged with Robbery (felony) and released to the Polk County Jail pending bond.